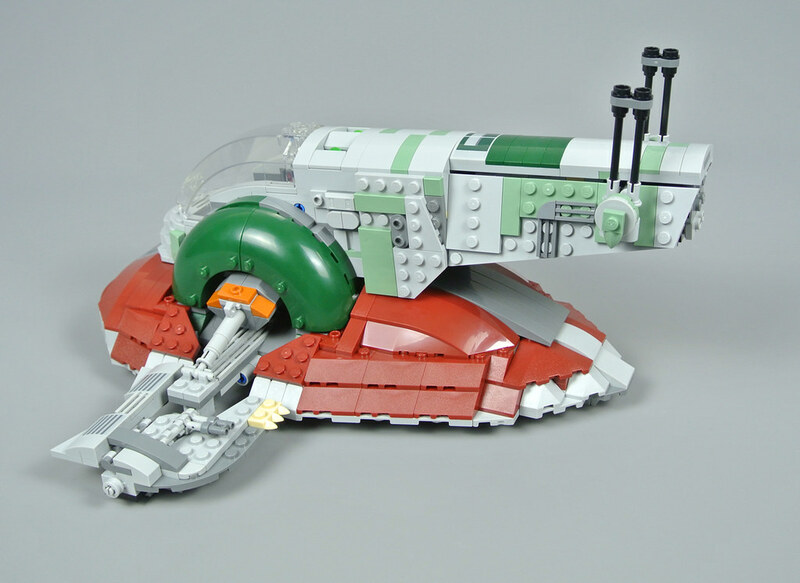 Many vehicles from the Star Wars universe have been subject to multiple LEGO models and Boba Fett's unorthodox craft has returned particularly often. 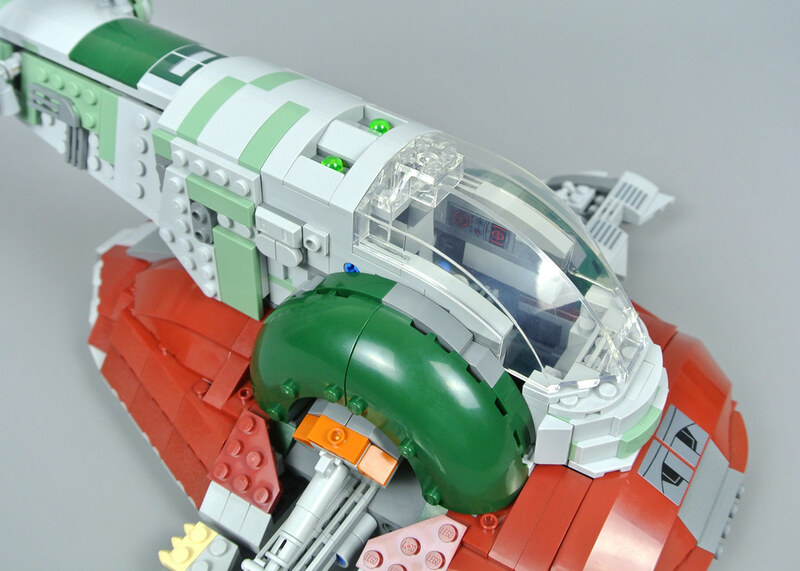 75243 Slave I - 20th Anniversary Edition is the fourth rendition of the craft at this scale and appears to represent a significant improvement over its varied predecessors. 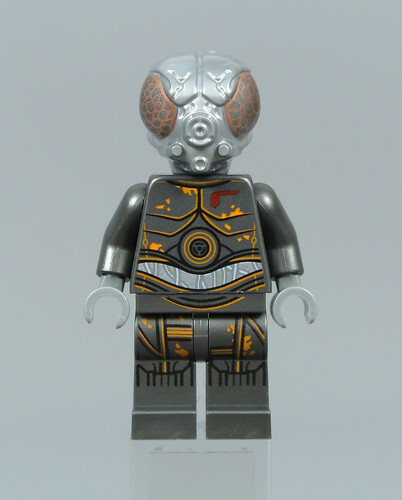 Moreover, the set includes an exclusive Zuckuss minifigure, thereby completing the famed group of bounty hunters who appear in Star Wars Episode V: The Empire Strikes Back. That is an enticing prospect and this model looks superb, although its price of £109.99 or $119.99 seems rather expensive. On the other hand, the new version does contain 1007 pieces so it should be impressively detailed. Darth Vader dispatches six bounty hunters to find the Millennium Falcon, the most famous of whom is definitely Boba Fett. 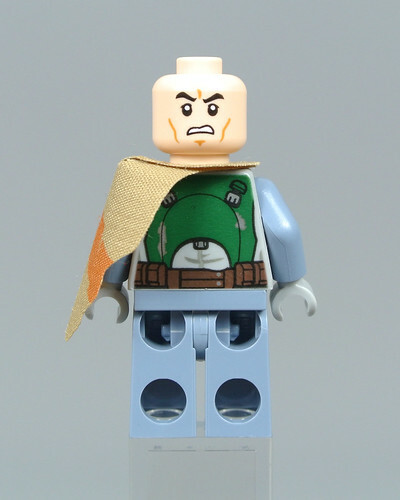 This minifigure is similar to that from 75137 Carbon-Freezing Chamber, although the dark green armour on torso seems slightly brighter on this occasion. It looks marvellous and I love the printed legs, featuring flame yellowish orange kneepads and metallic silver spikes on each boot. 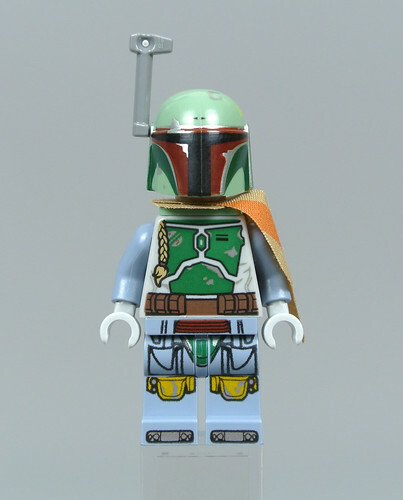 Boba Fett wears a sand green jetpack and a corresponding helmet. The latter element features some lovely metallic silver highlights, representing battle damage, while the head underneath was originally designed for Clone Troopers but is equally appropriate for Fett. The bounty hunter's ragged cape has been ingeniously decorated to depict folded fabric and he wields an EE-3 carbine rifle, as usual. 4-LOM originally appeared in 75167 Bounty Hunter Speeder Bike Battle Pack and this minifigure looks fantastic, featuring a unique head component. I like the marbled photoreceptors and the textured detail is thoroughly impressive as well. Pearl silver may not have been the most suitable shade for this piece though as the bounty hunter's head appears darker in images from Star Wars Episode V: The Empire Strikes Back. The torso and legs, on the other hand, are both superb. Pearl dark grey is a perfect colour choice and the worn paintwork looks remarkably realistic. 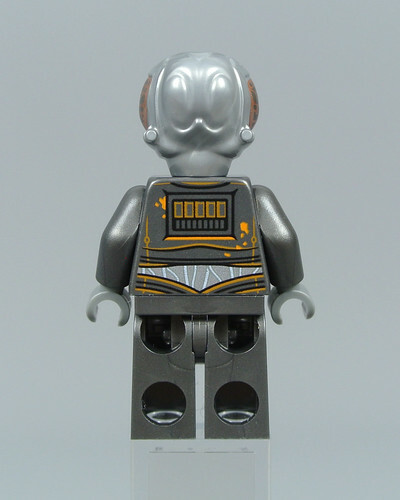 The metallic silver cables across the torso are excellent while the droid's chest is decorated with a subtle dark red sigil, demonstrating lovely attention to detail. 4-LOM carries a large blaster rifle, loosely resembling his DLT-19 rifle from the movie. Despite the exceptional design of 4-LOM, his bounty hunting associate is probably the highlight of this entire set. 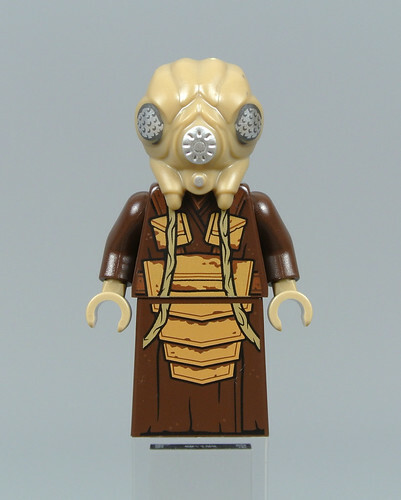 Zuckuss has been notably absent from the LEGO Star Wars range until now and I think the minifigure looks marvellous on the whole, featuring a new Gand head which is accurately moulded with breathing apparatus alongside two bulbous eyes. Recreating his mottled skin would be difficult but I am disappointed with the colour as medium nougat might be more suitable than this nougat shade. Nevertheless, his dark brown attire is faithful to the source material, incorporating a skirt element which recreates the character's findsman cloak. I like how the printed tubes line up with the mask on Zuckuss' face and creasing is found on both sides of the torso and skirt. The minifigure wields a double-barreled rifle which matches the film almost exactly, despite consisting of two existing parts. 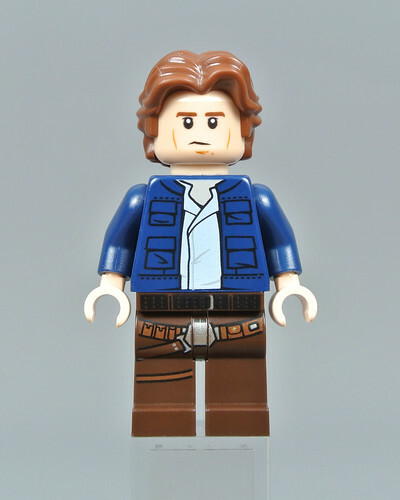 This version of Han Solo lacks the dual-moulded legs which appeared in 75222 Betrayal at Cloud City last year, presumably to preserve the exclusivity of that minifigure. Nevertheless, the holster looks nice and I like the intricately detailed belt which is printed across Han's hips. His jacket is equally appealing, featuring several pockets and stitched designs that reflect his appearance in the movie. An excellent reddish brown hair piece was created for Han Solo in 2016 and that element returns here. It looks fantastic when compared with the source material and I like this double-sided head, featuring a serious expression on one side and a smile on the other. The minifigure comes with a standard blaster pistol that resembles Han's distinctive DL-44. Han Solo in Carbonite is also included. This component was introduced in 8097 Slave I from 2010 but looks wonderful, featuring attractive textured detail across the front and metallic silver control panels on both sides. 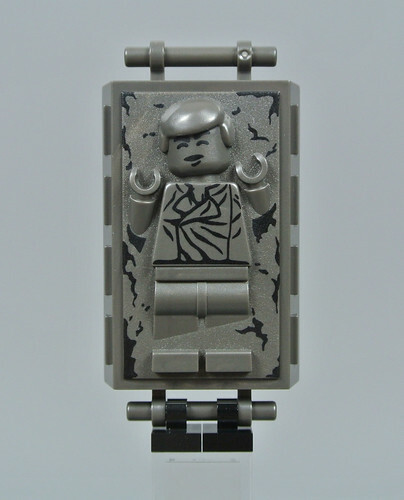 Unfortunately, the carbonite block has not been updated with Han Solo's modern hair piece which is disappointing, although I remain impressed with the differing textures and printed designs. 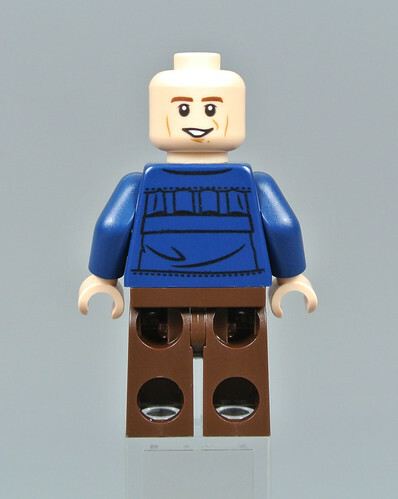 Each twentieth anniversary set contains a minifigure which takes inspiration from their original design. 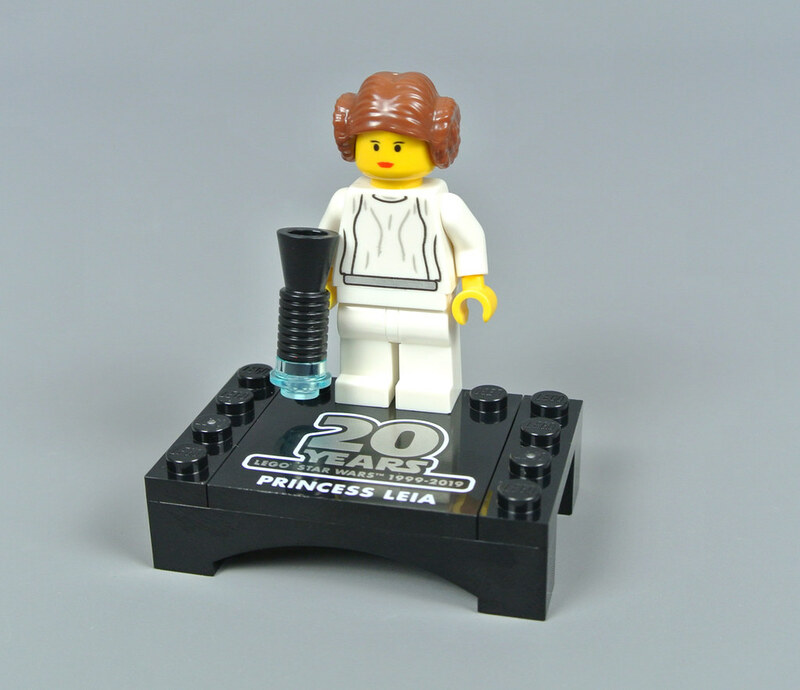 This version of Princess Leia was available in 7190 Millennium Falcon so features a yellow skin tone, corresponding with the figure from 2000. I am delighted that her classic hair piece has returned, albeit in reddish brown rather than brown, while the head features a single bland expression. 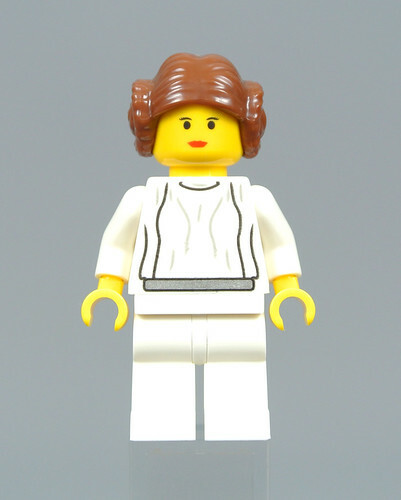 Leia's formal attire appears simple when compared with modern versions of the character, although it matches the classic minifigure and I like the metallic silver belt around her waist. 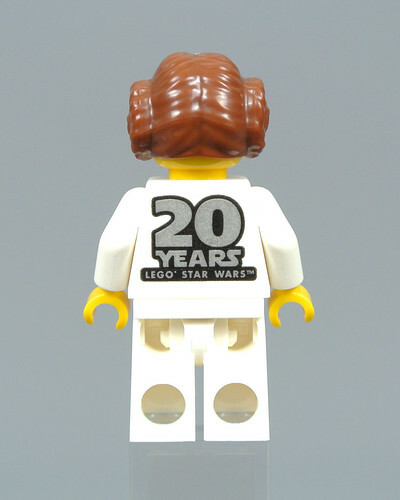 The reverse features the LEGO Star Wars 20th anniversary branding. I can understand why some fans were hoping that no alterations would be made but this design looks attractive. The minifigure wields a classic megaphone blaster. Black display stands accompany each twentieth anniversary minifigure and these are attractive in my opinion. The metallic silver branding looks brilliant and each character in the range is clearly identified. Furthermore, you can connect the stands together using a black 2x4 plate which is included, forming a lovely display should you collect all five minifigures. Numerous different versions of the Slave I have been produced, ranging in size from miniature Advent Calendar vehicles to the Ultimate Collector Series 75060 Slave I which measures 45cm in length. 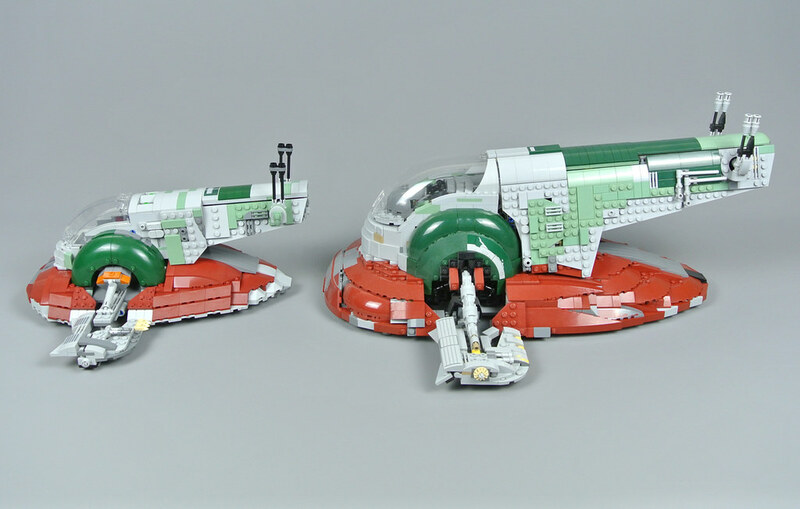 This example measures 29cm long and features a wingspan of 31cm so appears most comparable to 6209 Slave I and 8097 Slave I from 2006 and 2010 respectively. Constructing the craft at this scale allows the designer to capture tremendous detail, almost matching the significantly larger version from 2015, while concurrently ensuring that it is a suitable size for play. For instance, this model includes an angled fuselage so corresponds exactly with the movie and feels absolutely rigid. 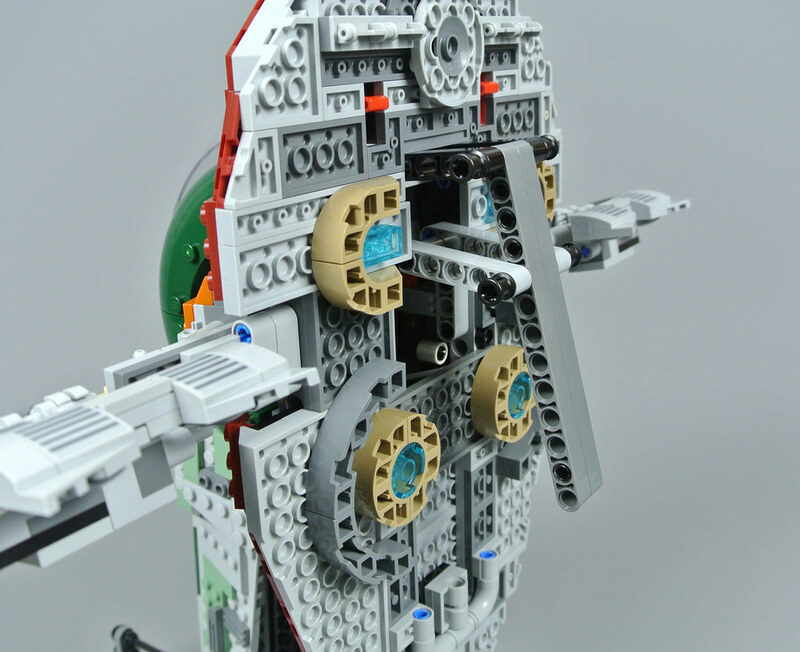 75060 Slave I is accurately shaped too but is more fragile and intended primarily display. The external bodywork features a perfect combination of exposed studs and smooth surfaces along with accurate colours. I think the dark green should probably extend further across each side but the sand green and dark bluish grey details look wonderful. There are no hidden weapons in this section which is disappointing but a Technic core occupies most of the internal space. Dark red has been selected for the engine cowling and looks marvellous in my opinion. The shaping is not entirely smooth but might be difficult to improve upon and it takes advantage of some relatively new pieces, incorporating sixteen 3x3 wedge bricks. Moreover, there is room to place Han Solo in Carbonite inside the cargo hold before closing the dark bluish grey access ramp. 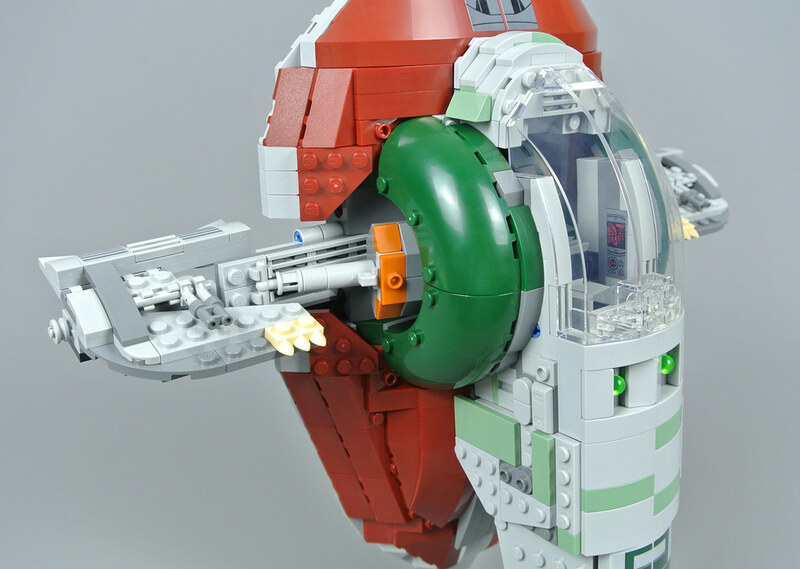 Stickers have often been needed to create battle wear around the engine housing on previous Slave I models but this example relies entirely upon bricks and the result is impressive. However, two stickers are applied on the exterior, accurately recreating the dark green and grey pattern which appears in the movie. In addition, the twin blaster cannons can rotated independently and they feel robust. Two spring-loaded shooters are located beneath the cockpit, replacing the flick-fire missiles and larger missile launchers which have occupied the same space on past sets. A perfectly smooth shape would be more accurate but these missiles look reasonable and the set could be modified to conceal them if you wish. The missiles are activated using red switches above the engines so there is some distance between the triggers and the weapons, although the mechanism works perfectly. An enormous trans-clear canopy protects the cockpit and looks similar to a piece which was originally created for 7153 Jango Fett's Slave I from 2002. This design is smaller though and its proportions are more faithful to the source material. Nevertheless, there is plenty of space for Boba Fett inside, with a printed control panel and two stickers surrounding him. These feature a technical readout for the craft alongside a red targeting display, closely resembling that seen during Attack of the Clones. The seat is simply assembled using Technic bricks and a couple of 1x2 grille tiles so it appears rather bland. However, this is because the entire chair can rotate when switching between landing and flight configurations! Similar functions have appeared on many Slave I models but this example is probably the most effective, due in part to its independence from the rotating stabiliser fins. I am similarly satisfied with their rotation function which works remarkably smoothly. 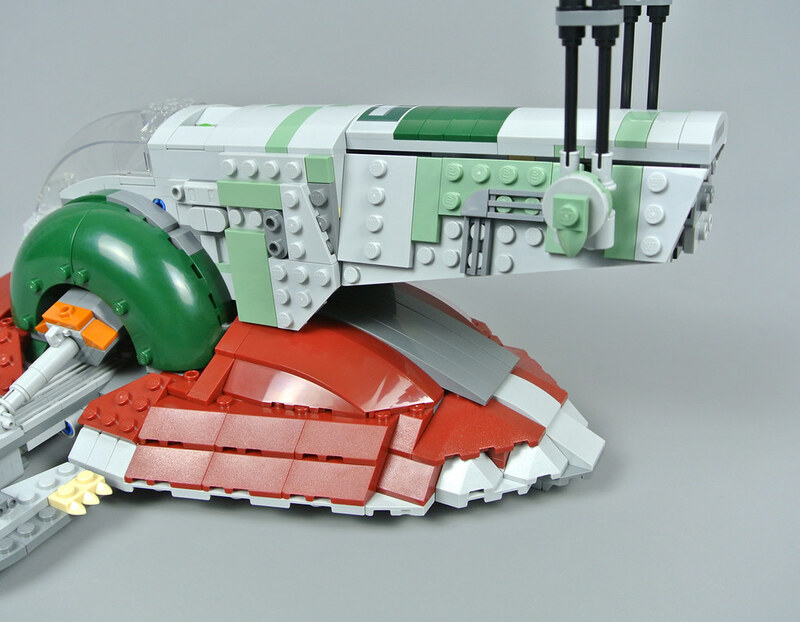 The model cannot stand in flight mode without support but looks imposing in either configuration, as one would expect for a bounty hunter's vehicle. 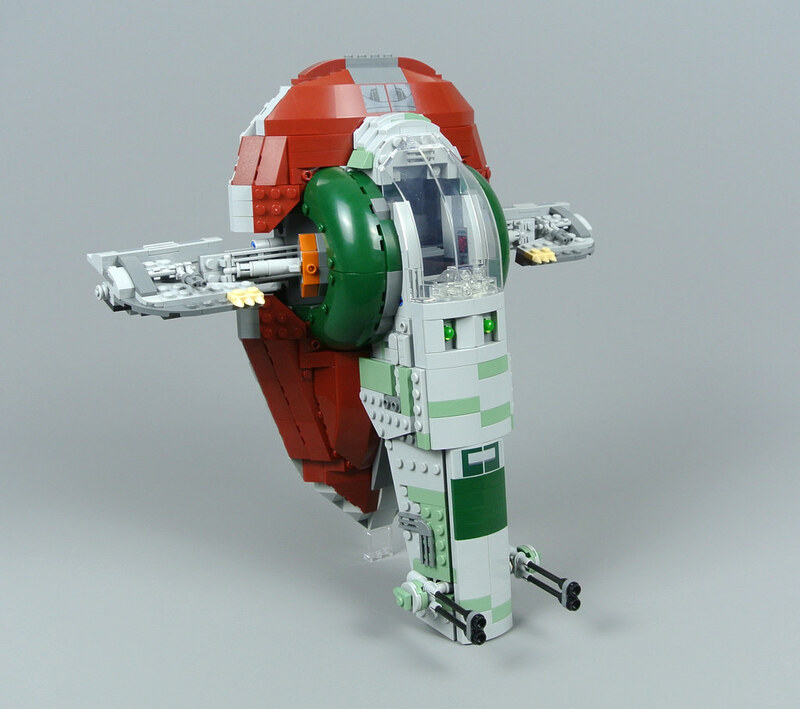 In addition, this rendition of the Slave I feels absolutely rigid which has been an issue on previous models but does not apply here, allowing you to grip it with complete confidence. Dark green 6x6x2 arch bricks form the rounded armour plating which shields the stabiliser connection points and the stabiliser fins are secured using Technic axles, enabling them to rotate easily. The dark orange highlights have elicited some discussion as they seem rather bright in relation to the movie but that does not detract from the model. I would change the tan pieces on the stabilisers though as I think bright light yellow might be more suitable. The vehicle appears less attractive when viewed from the rear, as one might expect. Even so, several thrusters are included beside some pipework towards the base and the spring-loaded shooter triggers near the top. The designer has also found room for two clips where you can store weapons which is a delightful inclusion. Internal storage might have been preferable but any solution is welcome. However, the most notable feature of this section is definitely the Technic carrying handle at its centre. This is linked directly to the Technic frame so it feels incredibly strong and weight is distributed evenly around the handle. Unfortunately, the engine band is therefore divided but I think that is a reasonable compromise as including a carrying handle is very useful, especially for younger children. 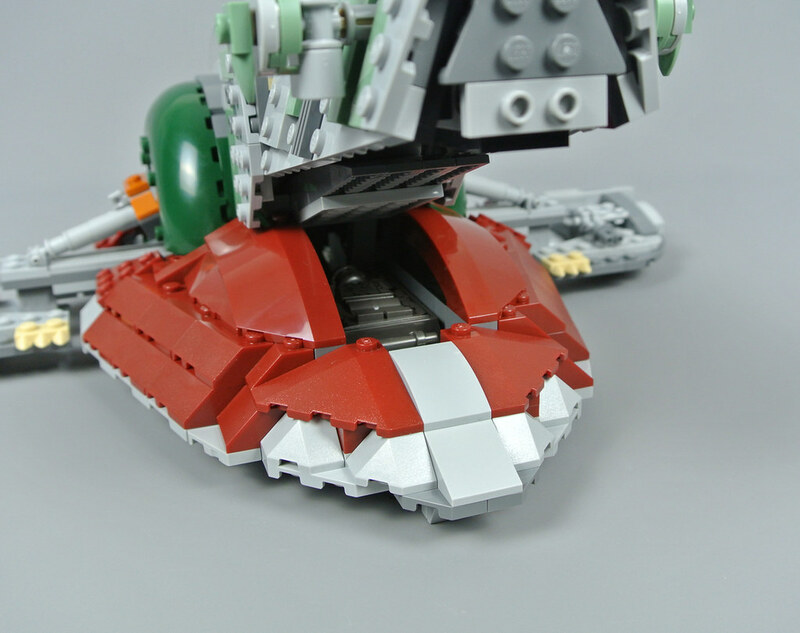 75060 Slave I remains the definitive rendition of Boba Fett's imposing vessel but this model is similarly exceptional. The vehicle feels extremely sturdy and incorporates some interesting functions while also capturing numerous subtle details. I am particularly impressed with the varied textures on the exterior as these faithfully replicate the worn appearance of the Slave I during The Empire Strikes Back. The minifigure selection is fantastic as well. Zuckuss appears certain to prove popular and compares favourably with the source material while 4-LOM is among my favourite Star Wars minifigures. 75243 Slave I - 20th Anniversary Edition is an excellent addition to any collection but the price of £109.99 or $119.99 feels expensive given its size. I would therefore suggest waiting for a discount but would still recommend this set. Always great to see slave one.. I find it unacceptable how they keep shrinking their models. People usually say it's because they "use the parts to make it more detailed", but I won't swallow that. Smaller version of the same craft will always feel cheaper to me. I love the coloring on this one! Can you guys please add a pic compared to 75060? I have not seen a single good pic of each side to side. While this set is tempting, especially in regards to the build, I'm probably going to skip on this one since I own 6209 and the UCS version (as much as I want Zuckuss, hopefully he'll turn up later, maybe in the Mandolorian?). I do think it's rather pricey for it being a similar size to 6209 and 8097 and I'd say at 20% off that would bring it down to a more reasonable price like basically all SW sets nowadays. 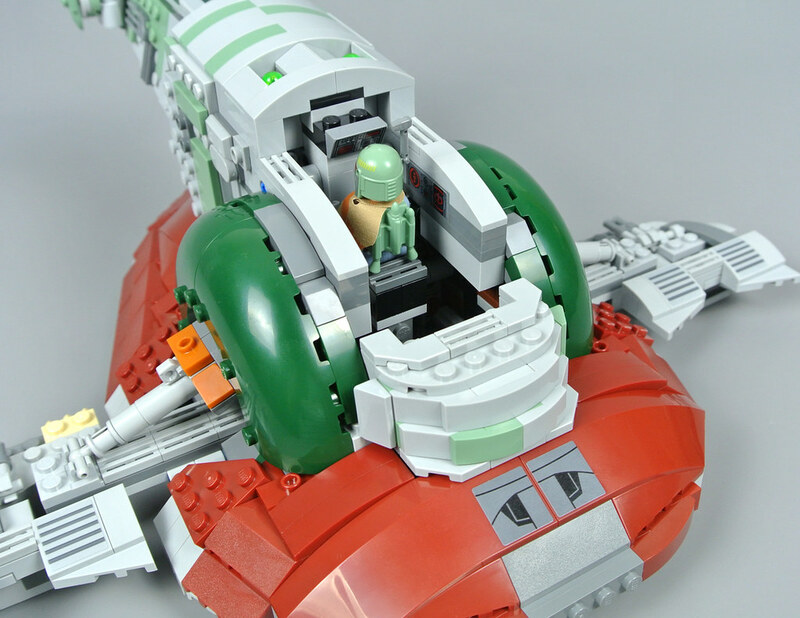 @Gustavo289 - A comparison image between this model and 75060 Slave I has been added to the review. Awesome review, I have the original (and the 2003 one that came with IG-88 and a Bespin guard) so other than Zuckuss I don't need it. Looking forward the AT-RT and Imp Troop Transport reviews and sets in my hands. @TransNeonOrangeSpaceman, I don’t know why you’re so upset with smaller models. Of course they won’t be as detailed, but they allow people to get iconic sets at presumably reduced prices and not take up as much space. By your comment then the only millennium falcon that should exist is the collectors series one, or any collector series ship even. There’s room for both in the line, and they should continue to offer smaller versions of the same ships. I just think it’s ridiculous that the UCS slave I was $230 and this is $160 when looking at them side by side. Still a very well done set though. @TransNeonOrangeSpaceman: That's kind of a surprising comment to see about the Star Wars theme, to be honest, considering how often I see people complain about exactly the opposite: how BIG, and therefore expensive, things like speeder bikes, X-Wings, Y-Wings, and TIE Fighters have gotten since the theme's beginnings. Honestly, it seems merciful that the sizes of subjects that were already fairly huge and expensive in LEGO form like the Slave I, Millennium Falcon, Clone Turbo Tank, and AT-ATs HAVEN'T continued increasing at the same rate as their level of detail, since that would only further exacerbate their already high prices! Also, while this set's overall dimensions are slightly smaller than #8097-1, some parts of it are noticeably beefed up: the Dark Red main dish is now three to four bricks tall instead of just two to three, the wing housings now stick out horizontally from the windscreen by about three and a half studs rather than just two and a half, the wing struts themselves are more reinforced instead of just being constructed from bare Technic connectors, etc. The fuselage also now reflects the gradual angle that it had in the movies, and the largely inaccurate gap between the body and wings has been reduced considerably. Comparing the sets against more film-accurate reference material like that which appeared in the manual of the UCS version, it's easy to see how this set uses similar techniques to achieve similarly accurate shaping and proportions, but now at a scale that's not nearly as unaffordable or difficult for kids to build and play with. I definitely understand how frustrating it is when changes in sets' prices and their spatial dimensions don't match up (even adjusted for inflation). But as far as I've been able to find online, this set has around a 70% greater weight, a 70% higher piece count, and a 90% more varied inventory than 8097. So it's hard to see anywhere obvious that LEGO could be cheating the consumer by raising the RRP without the costs on their end increasing by a comparable amount. @TransNeonOrangeSpaceman: Comparing this one to the UCS one, of course it's smaller. If it feels "cheaper" to you, that's because it is—it literally costs 40% less than the UCS version. Not everyone who wants one of the more iconic Star Wars ships is going to have $200 to drop on the largest, most detailed version available, so having a lower-priced option for those buyers is important. 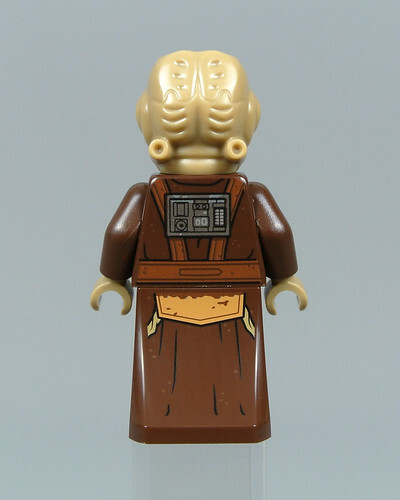 I want to buy a bunch of Zuckuss minifigures and recreate the scene in KOTOR2 where you fight your way through a bar full of Gand bounty hunters. LEGO have done a great job for a system-scale set, although the underside lets it down a little. It's certainly a vast improvement on 8097, which I owned before replacing it with the UCS version, but I just can't get over the RRP which is simply ridiculous. And, I'm still not sure about Zuckuss…. Lego's trans clear parts, don't look so trans clear as I remember on this ship. I would really like to have that Zuckus mining and the model seems nice, but the price is too high. I believe I got the UCS version for 140€, so I need to wait to get this below 80€, anything else would be insane in comparison. Man, this is a nice set. But, it's too pricey for me. Oh well. This is the set of the year for me. I don’t collect UCS and have been waiting for a good Slave 1 to replace my 6209. And it just happens to include a Zuckuss and a yellow Leia! Having 8097 I don’t feel the need to get this - maybe tweek mine a little, but it’s good to see the design develop - shame about the price. Amazed they made a unique Zuckuss Head.... I had thought that the general head shape/design is so similar to 4-LOM's that Lego might just repurpose / recolour that mould. Pleasantly impressed. Oh I like the idea of that play handle! That’s really cool. I gotta figure out how to get the wife to realize I need this and the Sand Crawler. This looks absolutely perfect for me and my kids to build and play with. The UCS version may be in my future, but for now this hits a sweet spot of size, cost, and playability. Out of my price range, I'm afraid, especially after picking up the Avengers Endgame sets. Really digging the old school vibe from this set, though; the ramp and the handle somehow give me a nostalgic feeling of the old Kenner ship from the 80's! 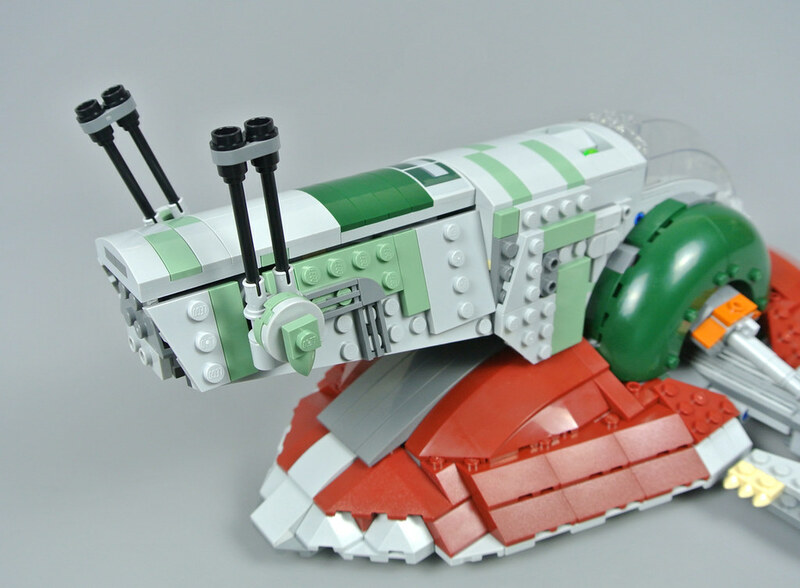 I have no previous version of Slave I, and each price jump has seemed to ensure that would remain the case. I remember feeling sad to turn down the fifty-dollar edition of this set... so in that respect, I still need the ship, but the new price is off-putting. I'm hoping to grab it on sale sometime, but I might consider seeing if I can bricklink it and just buy a Zuckuss and a Bespin Han, as I have a suitable Fett and 4-LOM. That handle is really cool. Nice touch--I love how Lego keeps site that these models are meant to be played with by kids. I initially wasn't going to get this one, but I'm rethinking now. Still disappointed we don't get a new one for Jango, though. I wasn't talking about the UCS versions of the craft, I was referring to the previous regular retail sets. 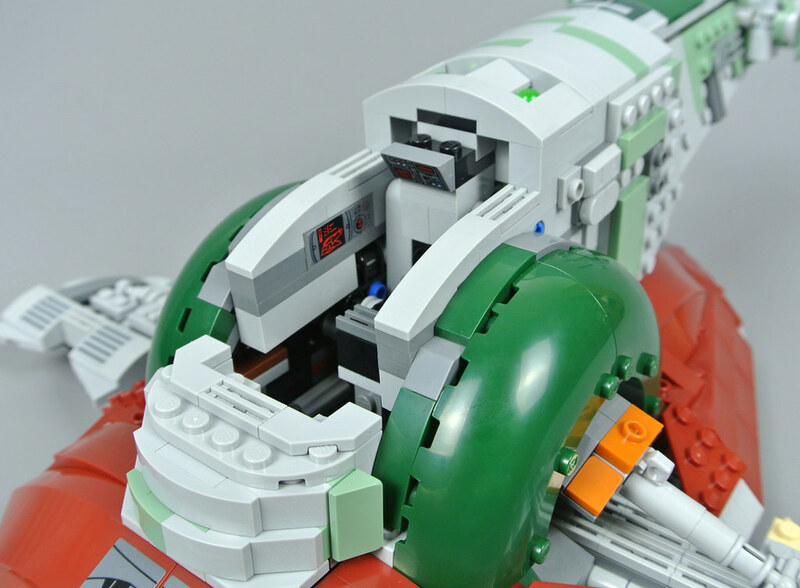 I never compare normal sets to the amount of detail UCS sets have - there's obviously no competition. I knew my comment would awaken conversation, but it's my own opinion and I stand beside it. Great set. 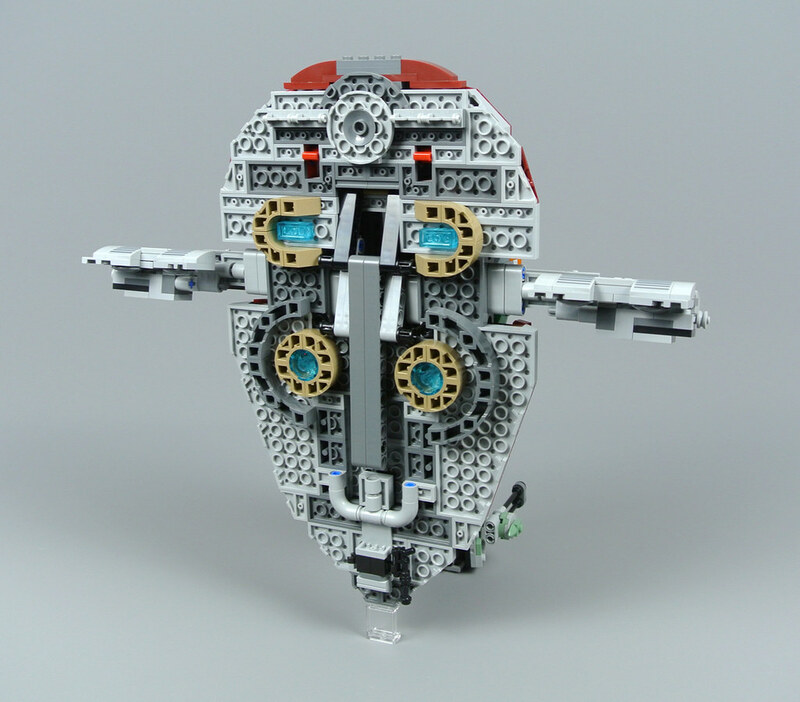 I already have the UCS version but still feel tempted by this. Also the handle seems like a great addition. Reminds me of the handle on my motorized walking AT-AT, which is also extremely useful on that model. Few weeks ago I bought 6209 - very nice set. 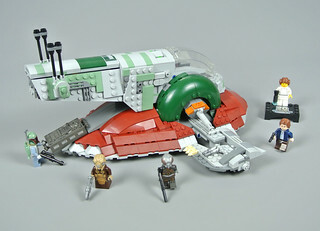 I love this version of the Slave I and will happily buy it (as soon as Target.com offers it at 20% off), but I'm surprised there's no mention of the obvious issue with this set: the 20th anniversary minifigure included ISN'T LANDO. I realize there's no thematic link between any of the other bonus minifigs and the anniversary sets in which they appear, but this omission seems egregiously calculated to force the purchase of the new Snowspeeder. I rarely get excited about playsets lately but this one really looks GOOD. I am just slightly disappointed that Lego wouldn't introduce a smooth curved windshield with the same proportions as this angular one. Otherwise, great set. I'm surprised neither you, Jang nor Brothers Brick mention the fact that there is a big opening to the cockpit from the back, which seems like a pretty big let down to me, but maybe it actually isn't then...? Excellent review. This is a must buy for me, maybe even at full price. I actually bought Yodas Hut and Hoth Medical Centre after reading this it got me so hyped!